“The finishing touch to a perfect train” is how the Milwaukee Road described its Skytop observation cars. One drawing room-kitchen, shower, 24 big, comfortable, reclining, rotating parlor chairs in the main section, and seating for 12 more in the Skytop solarium. Bleached-oak Skytop features 180-degree viewing. TV, VCR, CD and stereo. 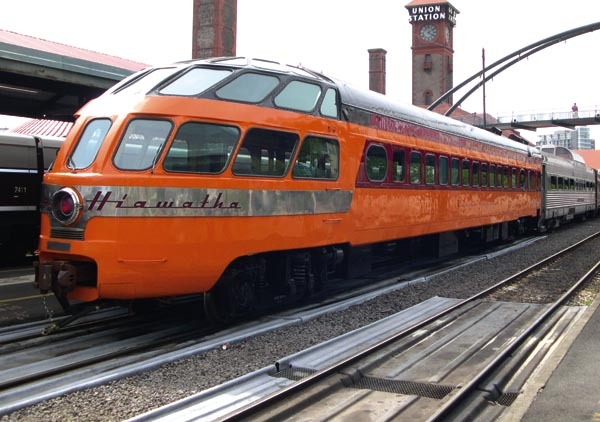 Designed by famed industrial designer Brooks Stevens and built by the Milwaukee Road in 1948 in its own Milwaukee Shops for service on the Minneapolis-Chicago “Hiawatha.” Retired in 1970 and donated to Brooks Stevens. Rebuilt 1984. Operated until 1990. Acquired by the Friends of the 261 in 1998 and returned to service. Railroading Heritage of Midwest America, Inc.